Sociology of religion expert John H. Evans has written a well-researched, multi-disciplinary text that speaks to our current historical moment. Using the sociology of religion; the history of sociology, science, and science's relationship with religion; and data sets from surveys and in-depth interviews, Evans explores and troubles the alleged "foundational knowledge conflict" between religion and science, or that schism resulting from the long-held assumption that religion determines truth about the world "through supernatural revelation" whereas science does so through "observations and facts" (1). Crucial to this conflict is how "scholars see religion and science as belief systems, in which people engage in deductive reason from the most abstract justificatory principles down to the most concrete claims" (7). Evans acknowledges that although there are three types of conflict-causing relationships between religion and science—systemic knowledge, propositional belief, and moral—it is the former that is the most well-promoted. The re-enforcement of the systemic knowledge conflict contributes to stereotypes about religion and science as well as to ineffective debate, if not polarization, in the public sphere. In subsequent chapters, Evans painstakingly articulates the evolution and perpetuation of this systemic knowledge conflict. In Chapter 2, he explains how elites from both the theological and the academic worlds, envisioning religion and science as iron-clad hierarchical knowledge systems, often assume that all conflicts concern knowledge. He also indicts scientific atheists, synthesizers, and various types of dialogue associations for "implicitly teaching systemic knowledge conflict to the public" (43). 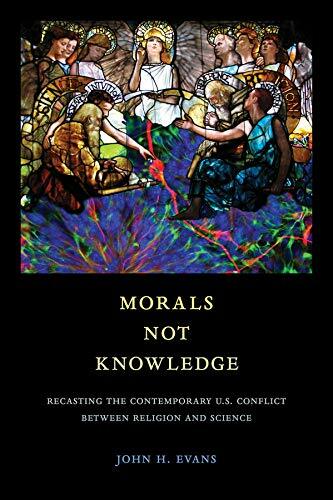 Chapter 3 further analyzes how not only theologists and scientists, but also historians and sociologists, through their research, issue framing, and focus on elites, are enforcing the systemic knowledge perspective while downplaying, if not ignoring, the moral conflict. Furthermore, sociologists, when they teach high theory, research the religiosity of scientists, or conduct surveys, often presume the "strong version of systemic knowledge conflict, where religion and science are incompatible at the highest level of the pyramid" (52). The exaggeration of this systemic knowledge conflict, especially when placed against a background of change in both people's relationship to religion and the assessment of science's role is the subject of extremely rich Chapter 4. Evans argues that in spite of recent shifts, scholars continue to rely on an outdated substantive definition of religion that sees it as operating in the worlds of the sacred, the irrational, and the supernatural, which are antithetical to science. In making grandiose claims of systemic knowledge conflict, scholars often conveniently underplay crucial research in the last half century which has revealed that rather than value-neutral or knowledge-centered, science is also embedded in social and moral relationships (the Edinburgh school). Science, too, has its own "intellectual gospel" (Hollinger qtd. in Evans 89), such as in Merton's laws for the ethical behavior of scientists and the transhumanist's almost religious faith in science for bettering humanity, if not creating post-human gods. One of this chapter's most crucial points, however, is the claim that resistance to evolution is not about denying facts, but about rejecting this theory's immoral baggage, which "devalues life, causes unnecessary conflict and competition, and pushes society in an actively harmful direction" (84). Chapter 5, relying extensively on Wuthnow's work on the sociology of religion and science, articulates that most people do not think abstractly or operate by hierarchical schemes; instead, they pick and choose to form incoherent knowledge systems composed of incompatible ideologies and facts. Rather than adhere to doctrine, Evans claims, many religious people are "bricoleurs" (107) who build their faith from selected principles that are meaningful to them. In short, he argues that a) American religion is not a coherent system of belief that could be in conflict with science; and b) very few religions teach their followers to reject scientific knowledge. Chapters 6 and 7 use existing data sets—surveys and in-depth interviews, respectively, to test hypotheses. From existing GSS survey data, Evans concludes that rather than systemic knowledge conflict, people have propositional belief conflict—they disagree with some scientific claims—particularly when it comes to climate change, earth origin theories, evolution, and genetic modification. These belief conflicts usually arise from status politics, a Baconian (empirical) view of science, and a defense of the Bible. In Chapter 7, analyzing in-depth interview data with religious Americans, he contends that rather than knowledge-based, the conflicts between religion and science are morality-based; these are primarily grounded on opposition to the institution of science leading society, suspicion of the moral stance/teachings of scientists, and concerns about the problematic ethics of certain tools, such as reproductive technologies. The conclusion, which returns to the propagation of the systemic knowledge conflict by both elites and the popular media, offers suggestions for more research in three primary areas of inquiry: the moral values of science and scientists, the values embedded in and taught by technology, and the ethical bases of particular experiments. Despite the scope of this book, there are a few weaknesses worth noting. Evans drops his objective perspective in his references to Dawkins and the scientific atheists, whom he accuses of having the "biggest soap box" (21) and practicing a dogmatic, if not religious, scientism. Those readers who are staunch defenders of the separation of church and state might also be uneasy about his implied defense of teaching creationism and/or intelligent design as well as his later suggestion (167) that teachers should conscientiously build a bridge to their religious students by addressing the immorality inherent in Darwinism. Furthermore, in his desire to be thorough, the chapters, composed of several subheadings, sometimes hold together tenuously. Nonetheless, despite his digressions, Evans rarely strays too far from his thesis. The breadth of his knowledge is also impressive, such as in his thorough classification of the dominant groups in the religion and science debate; his detailed summary of a 103-chapter 600-page encyclopedia to historicize the systemic knowledge perspective; and his classification of the various kinds of creationist beliefs. Evans also exposes the reader to scholarly texts from his own discipline, which they otherwise might not have encountered, such as Wuthnow's extensive work on the sociology of religion. The text is additionally eye-opening in its disarming of popular myths, such as the explanation that Galileo was not in, in fact, in a total war against religion; and that the Scopes' trial was not merely about evolution, but about issues concerning public education (79). In the current contemporary political atmosphere dominated by conflict and distrust, Evans provides a refreshingly open sociological perspective that may help to start a dialogue between the institutions of religion and science. He not only dismantles the systemic knowledge conflict but also educates readers about the religious public. In particular, this text will enlighten academics as well as atheists and agnostics of the fact that very few religious people, with the exception of Republic-aligned very conservative Protestants, reject scientific knowledge altogether. It also offers advice to both science students and practicing scientists; rather than take an unyielding stand, scientists should recognize that forcing people to accept all of science's propositions, especially those that are morally abhorrent or irrelevant to their lives, is both damaging scientists' public images as well as shutting down healthy debate in the public sphere. For scientists and the religious public to stop talking past each other, they need to meet on common ground. That is, if scientists want to make progress on such pressing issues as the environmental crisis, they must acknowledge the values embedded in their own research as well as recast scientific conflicts in terms of morality rather than knowledge.